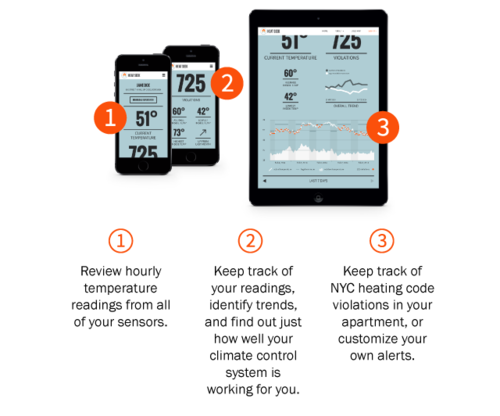 Our web-connected temperature sensors—essentially a thermometer connected to the internet—provide an affordable, reliable, and easy-to-use method of collecting, storing, and analyzing temperature data from a single apartment, many apartments, or even a portfolio of buildings throughout the city. We automate the entire process to provide tenants with the objective data they need to get their heat restored. The sensors now come in two options, wifi* or 2G cellular. This means individuals with wifi can conveniently connect their sensor to their home wifi network. For individuals without home wifi, a SIM card and cellular data plan allows sensors to quickly access the internet, no matter where they are placed. *For the 2017-2018 heat season, only wifi sensors are available for purchase. If you'd like to discuss purchasing 2G sensors, particularly for bulk orders or commercial uses, drop us a line at info@heatseek.org. Heat Seek sensors detect and track heating code violations in real time by taking temperature readings once an hour. Individuals, landlords, lawyers, and even city inspectors can use our web portal to view their temperature data in real time and set alerts if the temperature drops below the legal limit. Tenants can also access a user-friendly temperature log that’s familiar to housing court judges. Heat seek sensors provide tenants with the objective data they need to get their heat restored. Each analysis we produce is carefully constructed--our team uses a number of tools, methods and programming languages to extract meaningful information from a vast amount of data. Check out our github to see examples of our methods, and the detailed steps we’ve taken to construct our analyses and visualizations. What can you do with a Heat Seek sensor? View your temperature data and know exactly when your apartment temperature falls below the legal limit. Download comprehensive heat logs, which include the indoor temperature, outdoor temperature, time of day, and date for every reading captured by the sensor. Data is collected 24/7. Send certified letters, backed by data, to your landlord, management company, and/or elected officials. Use your data in an HP action in housing court. File for a rent reduction with DHCR. Demonstrate that major capital improvements (MCI's) or individual apartment improvements (IAIs) weren't done or weren't done adequately in your building.